Crowded, overlapping, or crooked teeth can affect the whole mouth, requiring comprehensive orthodontics treatment. However, not all cases of malocclusion are in need of such exhaustive orthodontic measures. For those lucky enough to have only a minor misalignment, there is a simple solution to that shimmering smile you desire. Through a treatment using only an orthodonticretainer, Dr. Kellyn Hodges is able to help her Philadelphia-area patients achieve a straight, dazzling smile. At the orthodontic practices of Dr. Kellyn Hodges, our patients are our main concern, and we will never prescribe any unnecessary treatment. During a personal consultation with orthodontist Kellyn Hodges, she will evaluate your case and determine if treatment using only an orthodontic retainer is right for you. 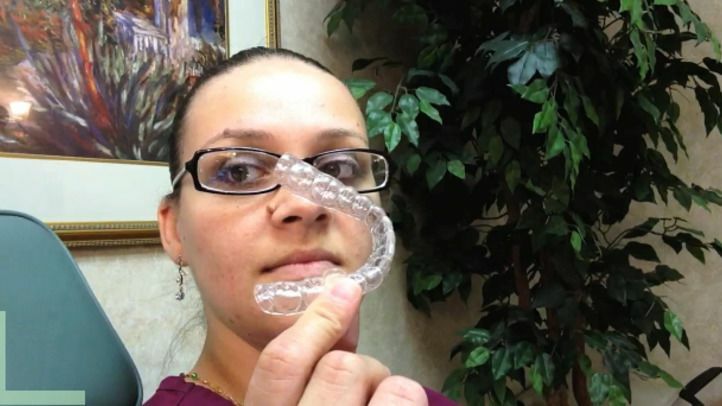 Dr. Kellyn Hodges describes types of retainers as offered at our Philadelphia offices. Retainers help keep the teeth in proper alignment. There are clear plastic aligners that fit over the teeth and retainers which utilize a metal wire and plastic part that fits within the arch. Why Deal With Metal Braces if You Don't Need To? For many patients, the biggest trepidation with orthodontics is the potential aesthetic impact. Because of this, orthodontics research has made advances in the mechanics and appearance of traditional orthodontic methods. In recent decades new advances, such as Invisalign® and Wilckodontics®, have shortened treatment time and improved the visible appearance of orthodontic appliances. But all of these advances are intended for patients with malocclusions and major misalignments, in need of full mouth orthodontic treatments. For those individuals with minor misalignments or imperfections, there is a far easier orthodontic solution: an orthodontic retainer. For her patients in the Philadelphia area in need of minor treatment, Dr. Kellyn Hodges offers orthodontic treatment requiring only an orthodontic retainer. In some cases the invisible orthodontic retainer is cemented in place behind the teeth for the duration of the treatment. Other patients in need of less substantial treatment can wear the orthodontic retainer when necessary, ideally for a minimum of 20 hours a day, removing it only for eating, brushing, and flossing. If the orthodontic retainer is worn properly, the minor adjustments should occur seamlessly over time. Why deal with the burden of braces if a less-involved treatment will suffice? At the orthodontic practices of Dr. Kellyn Hodges we prescribe orthodontics treatments that are tailored to our patients' specific needs. If you are considering orthodontics, you should consult with Dr. Hodges prior to making any decisions. Please contact the orthodontic practices of Dr. Kellyn Hodges to schedule a personal consultation for orthodontic retainer-only treatment at one of our Philadelphia-area practices.